The GM diet helps in weight loss because the main food components of this diet are low in fat and high in dietary fiber. Your caloric intake is also reduced, which further helps in giving you positive weight loss results. The diet also recommends a high-water intake, which helps in detoxification. What Do You Eat on The GM Diet? This diet is divided into 7 days, where you eat different foods on each day. It also recommends you to drink 10 to 12 glasses of water daily, to keep you hydrated and to flush out toxins and impurities from your body. While you are on this diet, whether you exercise or not, it is completely upon you. Intake of black coffee and green tea are permitted, but the addition of sugar or any other sweetener to it is not allowed. The diet also recommends that one should not stay hungry. The foods mentioned for specific days can be consumed in any quantity. During the diet, do not replace water with any other aerated beverage, alcohol or sugar-laden syrups that can be mixed with water. To begin with, finely chop the onion and green pepper. 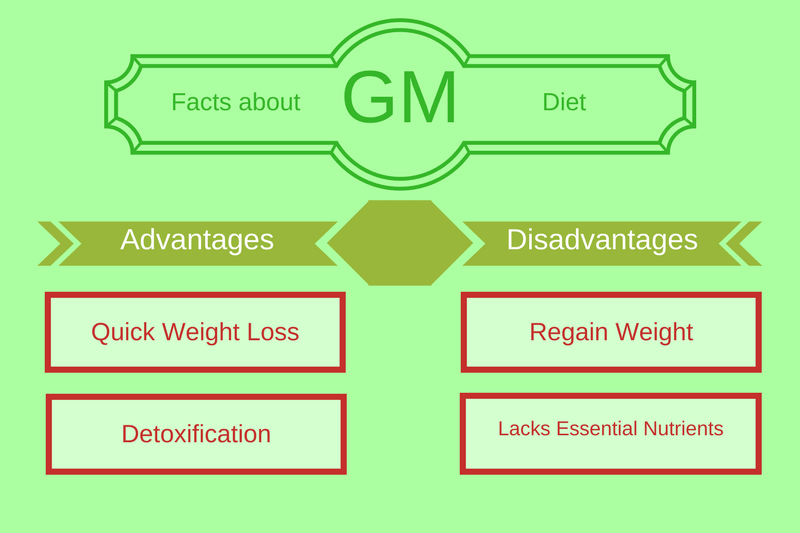 As mentioned above, the GM diet helps one lose weight quickly, within a short span of 7 days. Fruits with high water content and low-starch vegetables are a huge part of this diet, which promote weight loss by creating a calorie deficit. The diet also recommends one to limit the intake of sugar-laden beverages and alcohol. This further helps in weight reduction. Drinking a lot of water is an important part of GM diet. Drinking water helps in flushing out the toxins, impurities and microbes that otherwise have a negative effect on the health. Eating water-filled fruits and high fiber vegetables further help in cleansing the system. The diet allows you to choose fruits and vegetables of your choice. This makes the diet plan less restrictive and more doable. No scientific research has been carried out on this diet. The long-term effect of this diet plan on weight and overall health is unknown. Even if weight loss occurs after following this diet strictly for 7 days, you will gain the weight back once you return to your normal eating habits. The GM diet plan does not encourage exercise and intake of certain foods, such as nuts and oilseeds, which contain essential nutrients and healthy compounds, required by the body. The first 3 days of this diet are very low in fat, proteins, iron, vitamin B12 and calcium. In other words, the diet is not well-balanced and lacks essential nutrients. Do not start with this diet without asking your Registered Dietician. To achieve sustainable and long-term weight loss follow a well-balanced and wholesome diet paired with regular exercise. Though this diet encourages you to consume fruits and vegetables, many food groups are missing on different days of this diet. The GM diet is just a quick-fix and not a permanent solution for weight loss. With the help of a Registered Dietician incorporate a healthy diet into your daily life.